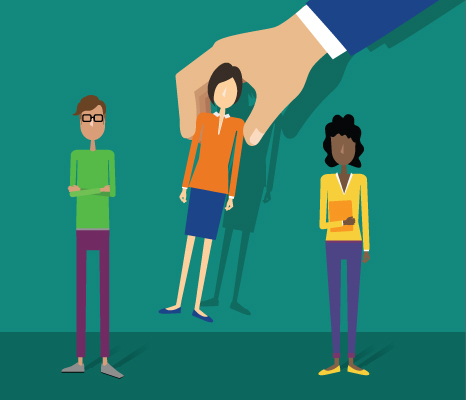 Do you know the difference between employees and independent contractors? Wrongly classifying workers has far-reaching implications, impacting the economy, quality of life for workers and competitive practices. Misclassification also exposes employers to significant risks. 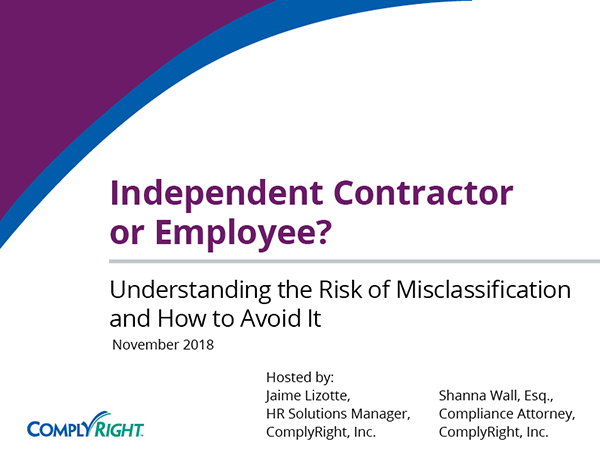 Manage these risks by learning the nature of employment relationships, how noncompliance is enforced, and the characteristics of employees and independent contractors. The employment relationship is evolving as businesses embrace technology. Companies today subcontract, franchise and outsource more than ever before. At the same time, freelancers, temporary workers, consultants and independent contractors grew out of a recession that left many disenchanted with “corporate America.” Businesses realized they could leverage this new way of working to secure talent at a reduced cost. The distinction between an employee and independent contractor is essential because the wage and overtime provisions only apply when a worker is an employee, as defined by the Fair Labor Standards Act (FLSA). In the eyes of the Supreme Court, no single rule or test is conclusive. The Court takes a holistic approach, requiring the entire relationship between the employer and employee be taken into account, regardless of job title or any mutual agreement between the parties. Wrongly classifying workers has far-reaching implications, impacting the economy, quality of life for workers and competitive practices. The long-term consequences of employers wrongly categorizing workers as independent contractors (vs. employees) include workers’ loss of entitlements such as benefits, minimum wage and overtime protection; federal and state governments’ loss of tax revenues; and reduced funding of state unemployment insurance and workers’ compensation funds. Although the Department of Labor (DOL) supports the increased use of independent contractors in the workforce, recent worker complaints have unearthed intentional employer misclassification errors to reduce labor costs. Noncompliance may lead to such penalties as unpaid payroll taxes plus interest, back pay for overtime and business expense reimbursement, and compensation for lost benefits. The WHD Fact Sheet 13 outlines factors “generally considered” when making the determination. Equally important are the factors that are immaterial: a signed agreement of an independent contractual relationship, the fact that a worker has an incorporated business; a worker’s license through a government agency; or the timing or method of compensation. Most recently, on-demand service and delivery companies such as Lyft, Instacart, Postmates, Caviar, Handy, Homejoy and Uber have come under fire for misclassifying workers. In many cases, workers are expecting reimbursements for the expenses required to complete the job – such as cleaning supplies, vehicle maintenance and gas – but these “on-demand startups” are not required to provide reimbursement to independent contractors. Uber’s argument against class-action certification is that their workers vary in hours worked and platforms used and, therefore, cannot be lumped together. Although this defense may be weak based on how drivers sign up and find passengers, the company argues that their workers are independent contractors by choice who enjoy the flexibility to build their own work schedule. While it is true that the Internet and the economy have inspired a passion for independent contracting, the reality is that every worker relationship deserves careful attention in light of labor laws. Therefore, companies would be well-advised to look closely at their workers and assess how they stand against the economic realities test.